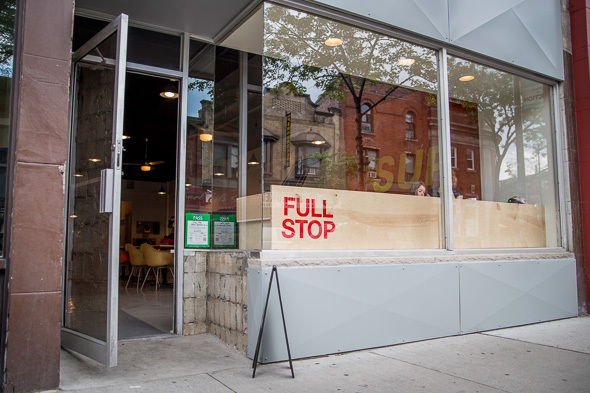 Full Stop has, potentially, one of the most fitting names of any new business in Toronto. The new spot in the Junction , just west of Keele and Dundas, is pretty huge as indie cafes in the city go, with seating for about 40 plus a giant patio. A huge yellow sign is posted on the wall, jovially hollering "sup" to visitors. All the open space and seating make you feel like you don't have to rush out. . Full Stop is owned by Chris Brown, one of the owners of Margret just next door, and it has a similar look and feel. 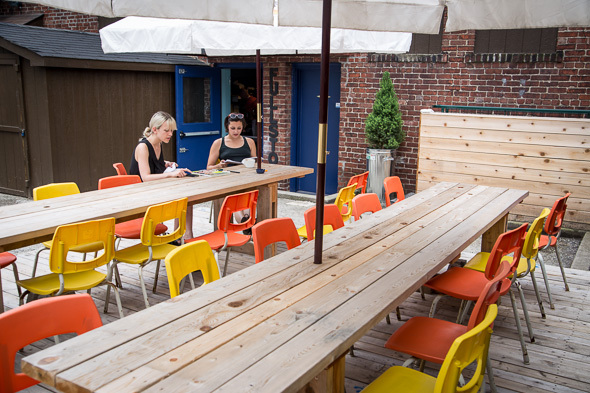 The patio, which seats about 20 and has space for plenty more, was actually built for Margret, but didn't wind up belonging to it because of issues with liquor licensing. It's totally outfitted with umbrellas, and offers plenty of space to lounge around. 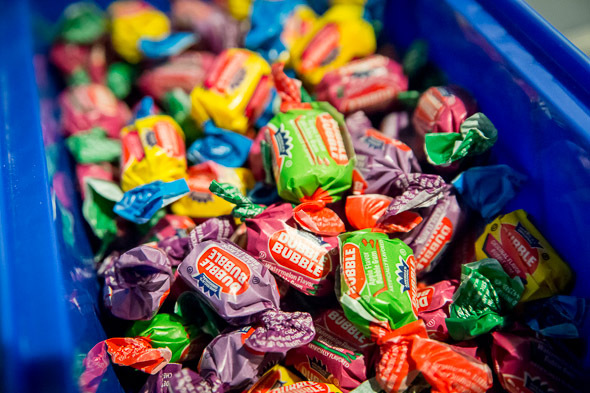 Inside, the liberal splashes of orange, which everyone knows is the colour of happy, and the nostalgia bombs like containers of Dubble Bubble sticking out of the walls, make you feel like you're welcome to stay as long as you like. And I do. The day is hotter than the hinges, so I grab a melon mojito as soon as I arrive. 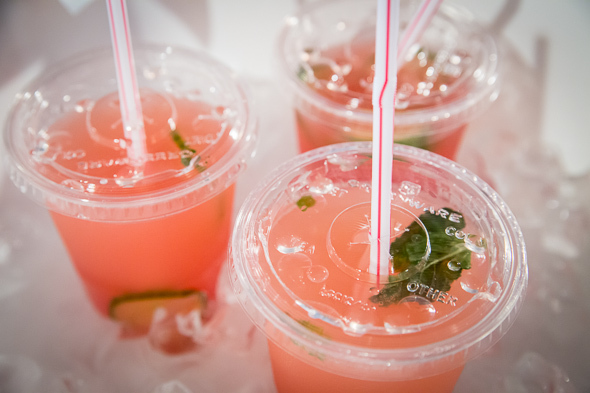 It's to die for: real watermelon pulp, club soda, mint, and simple syrup combine for heaven in a plastic glass, and it's only $2.50. As I sit and chill, a few other people in their 20s work or watch cat videos on their laptops. Wilco's "I Might" plays softly in the background (it could stand to be louder, to be honest. Good song). A lady in her fifties reads a magazine and eats a delicious-looking egg concoction. 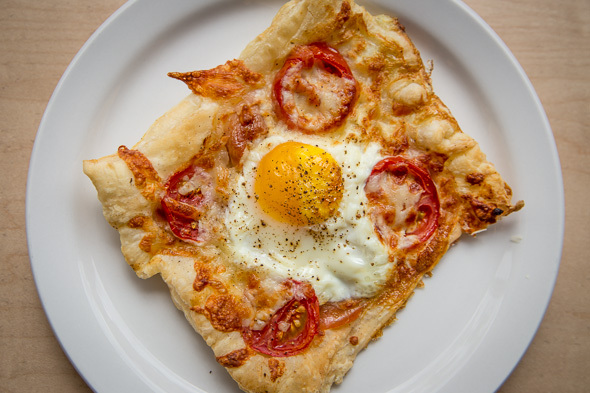 I'm just nosy enough to interrupt her and ask her what it is, and I get this impromptu review: it's a pastry with egg, prosciutto and tomato. "It's light" she tells me, mouth full of eggy delights. They deliver the same thing to my little table. It's divine, and though it's a pastry, it's as filling as a meal thanks to the whole egg and some light cheese drizzliness. 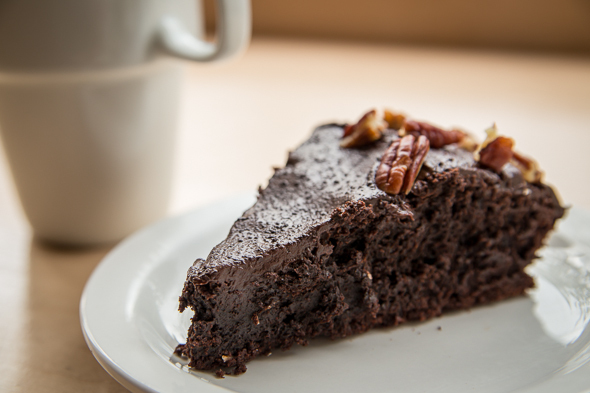 They also serve several desserts, like lemon ricotta loaf, flourless chocolate cake, and curried apple bran muffins. I can't help but sample a pastry stuffed with fresh berries, and it is an amazing juicy explosion in my mouth. It makes sense, because everything is made on site. "We have baker and chef kinda people," the cute barista tells me. (The baker and chef kinda people wave happily at me). 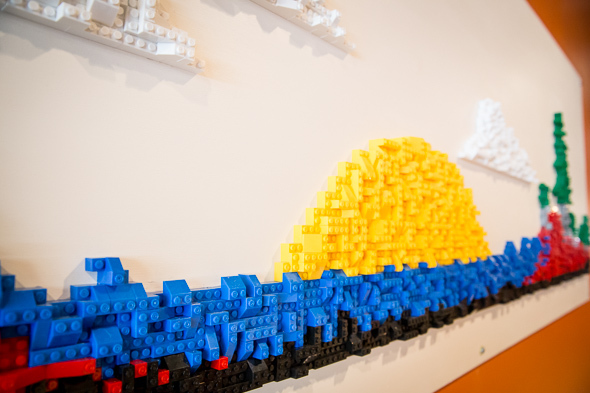 I ask the manager, Michael, what the story is with the lego sculptures and bubble gum: are they trying to be an especially kid-friendly place? He says they obviously want to be kid-friendly, but the Junction is home to everyone, so they want to keep an open atmosphere. And all sorts of people drift in and out as I sit and work: new parents with a baby, mamas with young children, people in their 20s. 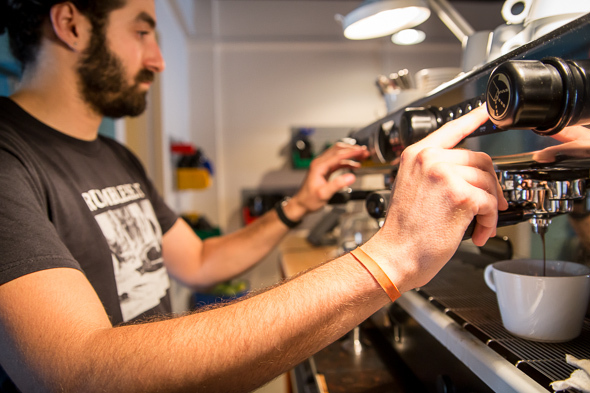 The owner of Opticianado pops in to check out the newest café in the hood. Though there are plenty of cafes in the area — Amani Earls , Crema , and The Good Neighbour to name just a few — it seems Full Stop is already on its way to becoming a bit of a neighbourhood institution. Right now, Full Stop is open seven days per week from 9 a.m. to 5 p.m., but they plan to expand those hours from 7 a.m. to 7 p.m.